Departement of Var - Pop. : 200 inh. Near Lake St. Croix, on route D9 which links Aups (5km.) 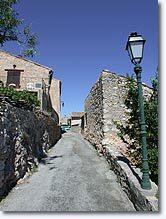 to Montmeyan (10km.). From its 600m. 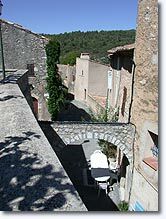 altitude, Moissac-Bellevue has an exceptional view that extends from the Esterel massif, through that of the Maures, and on to the Ste. Baume mountains. 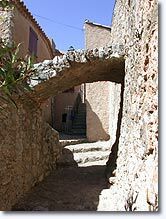 The village has kept its true Provençal atmosphere. You will appreciate this when seeing the cobblestone streets, steep stairways, and vaulted ocher houses with roof tiles turned golden in the sun. There is also a campanile, a magnificent fountain and a 12thc. chapel. 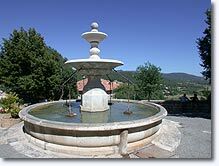 Its peacefulness and sunny climate make Moissac-Bellevue a pleasant place to stay in the midst of pine and oak forests. 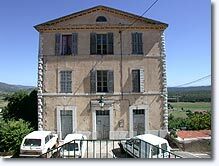 It's the perfect stopping point between the coast, the Gorges du Verdon, and Haute Provence. 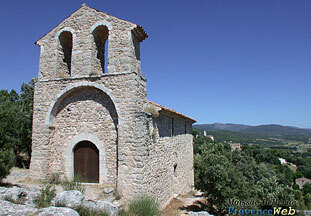 Notre Dame de la Roche. The old rectory. Clock Tower. Fountain. Dovecote. Castle. Templar Chapel. Vacation Rentals. 3 cottages for 2-4 persons on a large landscaped park. 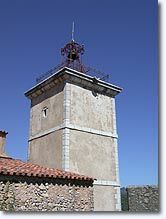 Régusse (3 km) and Baudinard sur Verdon (7 km).